Be prepared and aware with the Etón Grundig FR200 emergency radio. 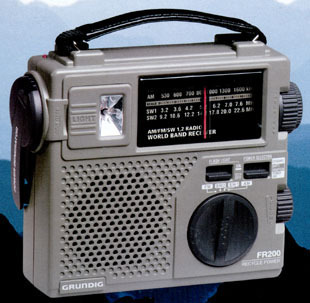 This affordable analog portable receives AM (530-1710 kHz), FM 88-108 MHz and shortwave in two bands: 3.2-7.6 and 9.2-22 MHz. The FR200 operates from a wind-up generator, or 4.5 VDC [ - ] or 3 AA cells. The generator charges the supplied, replaceable NiMH cells. Two turns per second for 90 seconds will provide 40 to 60 minutes of operation. This radio features analog tuning with a concentric Fine Tune knob. This permits very smooth, precise tuning. The FR200 has an integrated, padded carry handle. There is also a built-in emergency light that is surprisingly bright. There is a mini earphone jack on the back panel. The built in 2.5 inch speaker provides very pleasing tonal quality. The battery compartment allows access to the built-in NiMH pack or for the three optional AA cells. This radio is sand (gray) colored. The radio comes with a very cool canvas carry case with shoulder strap. The case even has a pocket to store papers. 6.75 x 5.75 x 2.75 inches. The GPU3504 AC adapter is optional (see below). Please note that some colors are labeled as Grundig and some as Etón. Copyright 2002-2015 Universal Radio, Inc.